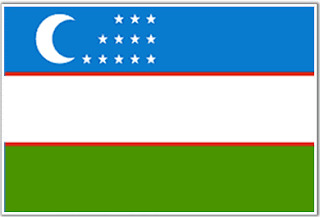 In November 1991, Uzbekistan became the first former Soviet republic to adopt a new flag. Over 200 proposals were submitted in a design competition. Blue is the symbol of the sky and water. It represents eternity and life. The banner of the national hero, Amir Timur, was also blue. The white stripe is the traditional symbol of peace and of moral and spiritual purity. The green stripe symbolizes nature and youth. The red stripes signify life force. The white crescent moon embodies the historical and religious legacy of Uzbekistan and also the country’s 'rebirth' and independence. The 12 white stars represent the historical heritage of astronomy and science as well as Uzbekistan's ancient, solar calendar. It is interesting to compare the new flag with the former Uzbek SSR flag, adopted in 1952. Here blue represents the sky and red is the revolutionary struggle of the working masses. The white stripes represent cotton (Uzbekistan is the world's 3rd largest cotton exporter), the hammer and sickle represent the peasants' and workers' union, and the red star is the symbol of the proletariat. As you travel around Uzbekistan you will see the flag flying everywhere and the blue/white/green combination often used in architectural detail.